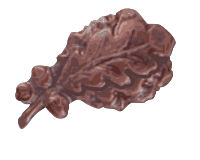 The Oak Leaf Cluster is a medal device used by the military to denote subsequent awards of a medal that has already been earned. They are bronze or silver with bronze denoting one subsequent award and silver used to denote 5 subsequent awards. In my dad’s case, he earned Oak Leaf Clusters to denote additional Air Medals for every 5 missions successfully completed. Photo Credit: United States Government. Position: #3, #2 Element, Lead Sqdn., 41st “A” Gp. Bombs Away: 1111; 25300′; -36 degrees C.
Remarks: Light but extremely accurate flak crossing Rhine River. First four bursts bracketed our plane. Smoke from one burst filled plane. Damaged quite extensively. Salvoed bombs and left formation. Turned back. Oxygen system from radio room back shot out. Crew existed on oxygen bottles until over friendly territory. Joined another formation & came back. Flat tire on tail wheel but landed OK. Counted over 100 holes in plane. Miracle no one injured. Scared to hell on this mission. 1st Oak Leaf Cluster.